It looks like the odds were ever in my favor in Q2 2012! Like the previous quarter, I didn’t start the second quarter on a strong note. Fortunately, my next trades turned out well enough to put me back in the black as early as late May. As good as my performance has been compared to Q1, I’m still looking for ways to improve my game. And as a shout out to all the readers and traders out there who constantly support my trade and market blogs, I’m sharing with you my thoughts on my trades straight from my personal trade journal. Most of my trades in the second quarter involved comdoll ranges and jumping in on intraweek trends. I noticed that patience, flexibility, and not being too greedy were the main reasons why I was able to limit my losses. For instance, I avoided a serious loss on my AUD/USD trade when I decided to stay out after I saw conflicting signals on different time frames. I also secured wins by locking in profits or moving my stop losses ahead of major events like the NFP report in my USD/CAD trade. On the other hand, I could’ve profited from my NZD/USD Fib play if only I wasn’t too strict on my entry levels. Even my AUD/USD breakout trade could have done a lot better had I pressed my position instead of quickly locking in profits. My least profitable trade was a double heartbreak for me as it also broke my winning streak from Q1. I traded NZD/USD’s range between .8250 and .8125, but upside surprises in Chinese data boosted the Kiwi above my stop loss. It was a good idea at the time, but it still cost me 0.50% of my account. Boo! My best trade happened in June when I used my STA strategy to get more out of a winning position. I entered at a Fib retracement when I thought that the risk rally would reverse after the FOMC statement. I closed two short positions just above my original profit target and locked in a total of 280 pips. My thanks to those who gave their two cents! For the next few months, I’ll try to work on three resolutions. First, I should have a backup plan ready in case my orders don’t get triggered. Having a backup plan doesn’t mean that I enter at market though. I could jump in with a new risk ratio, or I could still decide to stay out. I should also work on increasing my position sizes. I could’ve made so much more than 2.43% in three months if only I had risked a bit more. Maybe I can start with 0.75% to 1.00% per trade? My last but not the least resolution is to keep on being patient. This applies to spotting setups, waiting for price to hit my orders, and in profit-taking. I know it’s the simplest resolution out there, but somehow it’s also the hardest. Patience has worked for me in Q2, so I’ll try to replicate it in Q3. That’s it for me today! What about you? What are your trading resolutions for Q3 or the second half of the year? Care to share? It’s time to zoom in on comdoll price action! How did AUD, CAD, and NZD fare against the dollar in the last three months? The comdoll gang had a mixed performance in April as both Aussie and Kiwi chalked up roughly 1% in losses while the Loonie managed to sneak in a 1.04% gain against the Greenback. At that time, expectations of a rate cut from the RBA weighed AUD/USD and NZD/USD down while a relatively upbeat outlook from the BOC kept the Loonie afloat. The following month, all three commodity currencies suffered huge losses against the safe-haven U.S. dollar as talks of a potential Grexit brought risk aversion back in the markets. On top of that, weaker than expected economic figures on China led to concerns about a global economic slowdown which also didn’t bode well for higher-yielders. By June, euro zone debt problems began to take the backseat as QE3 speculations stole the spotlight. Commodity currencies took advantage of dollar weakness back then, with the Kiwi bagging more than 6% in gains. 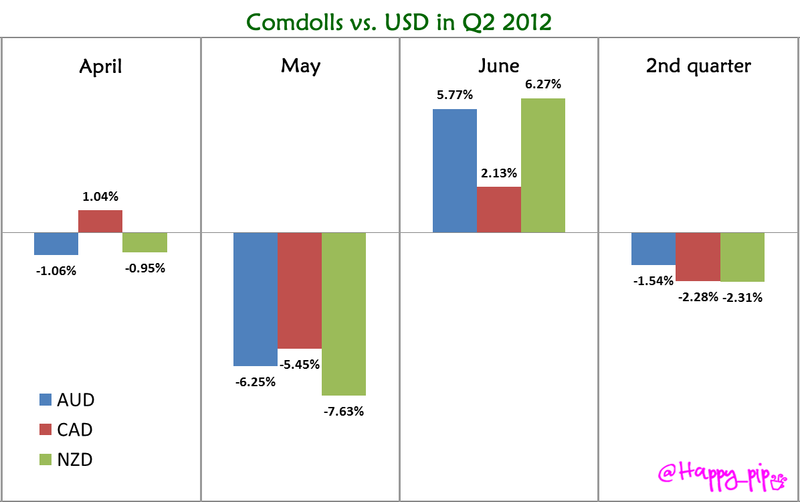 However, the rebound in June still wasn’t enough to put the comdolls back in the green for the entire second quarter. 1. Greek debt drama: Just the tip of the iceberg? And the saga continues! No, I’m not talking about the overrated Twilight series. I’m referring to the euro zone debt drama, which seemed to get more and more complicated over the past three months. For one thing, we’ve heard talks of a potential Grexit as political turmoil in the country almost forced them to forego another set of much needed bailout funds. Even worse, concerns of a possible euro zone breakup threatened the very existence of the euro, and these uncertainties kept risk appetite at bay for most of April and May. Hey, that rhymes! 2. U.S. economy doing so, so bad. QE3, maybe? For the past three months, the U.S. churned out bleak economic figures which revived talks of QE3. I already touched upon the prospect of further easing from the Fed in my first quarter review, but it appears that the calls for QE3 have been much stronger lately. In particular, the June FOMC statement had a huge impact on market behavior prior to and after the actual event. Traders began pricing in QE3 speculations the moment Uncle Sam released dismal NFP data as they sold the U.S. dollar off during the weeks leading up to the FOMC decision. Once the Fed settled on an extension of their Operation Twist program, the dollar was able to breathe a sigh of relief and regain its safe-haven appeal. Despite the lack of liquidity and the choppy moves during the start of summertime, currency pairs were able to make strong moves before the quarter came to a close. That was when the EU Summit concluded and the leaders announced that they came up with a bunch of proposals to keep the euro zone debt crisis from worsening. Higher-yielding currencies such as the comdolls were able to take advantage of this positive turn in risk sentiment, as traders were overjoyed to find out that EU leaders were finally taking action. Whether these rallies would carry on until the coming months remains to be seen. Any ideas on what we should watch out for this coming quarter? Don’t be shy to share ’em with me!